"NEW Clinique Superprimer Face Primers are available in one universal formula and five tinted formulas designed for specific skin care needs. 30ml RRP £20.00 / €27.00. Shop now at www.clinique.co.uk or visit a Clinique counter to discover your skin type. Ask for a foundation fitting and you will receive a complimentary 5-day sample of your chosen formula." I always say that a foundation always works best when used with a good primer, Together they make the perfect base for your look. I think skin is the most important part of a makeup look and taking steps to make your skin look as beautiful as possible is one thing you should really be aware of. Clinique Superprimers are silicone based primers which is great for prolonging foundation and keeping oiliness at bay and come in different shades to counteract different skin discolouration problems. 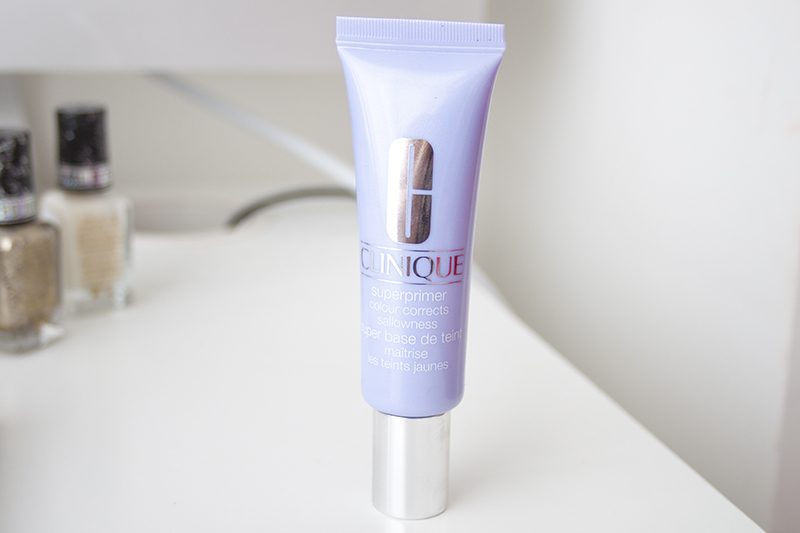 For example the lilac tones in the Sallowness primer aim to brighten the skin tone and neutralise yellow tones. The primer claims to help add luminosity back into the skin and brighten even the most lacklustre of skin tone. The product applies nicely to the skin to give a powdery velvet-matte finish. Due to the ammount of silicone in the primer means they do give a flawless, refined texture to the skin. This evens out pores, fine lines and blur imperfections. As a skin primer I felt this worked really well, it kept my oiliness at bay while blurring out my large pores and areas of unevenness. I find my skin really likes silicone primers so it did kept my skin looking fresh throughout the day and I didn't have to cake the powder on to give a semi matte base which I tend to go for. While I felt the tone did counteract some of the yellowness in my skin but I felt it could also be a little bit more pigmented as the lavender colour is very pale.Overall I think it's a nice product if you're looking for a primer to make your makeup last but I find the pigment for a sallowness corrector just isn't quite there. I do know this comes in a variety of tones dependent on what skin aliment you have so the other shades might have a little extra-something-something that this one lacks. Definitely worth grabbing a sample of though!